The Himalayas deserve their Sanskrit name; they are indeed an “abode of snow.” Thick blankets of white cover long stretches, making the mountain range the largest non-polar ice mass in the world. Only Antarctica and the Arctic can boast more. There are about 15,000 glaciers covering seventeen percent of the total range. High in the mountains, a glacier forms as snow accumulates and compresses first into “firn,” a granular ice, and then finally into glacial ice. While a glacier may look static, it is always moving, albeit slowly. Pushed by its own weight, the glacier flows down the mountain, grabbing rock and debris with it. As it moves south to warmer temperatures, the foot of the glacier will slough off – giant pieces break and melt. See Graphic: Anatomy of a Glacier. In the Himalayas, the fresh water produced by these glaciers is crucial to the river systems that exist within the mountain range. Like most things, glaciers go through cycles, periods where they tend to accrue mass and periods where they tend to lose mass. These cycles match up perfectly with river cycles. Glaciers feed rivers at higher rates before and after the monsoon season, when rivers most need additional water. Without these frozen, freshwater “storage units,” there would be a severe drop in the water levels of major rivers like the Ganges, Indus, and Brahmaputra and droughts would become common – particularly during the dryer, hotter seasons. This would be a devastating blow to the plants, animals, and more than a billion people who rely on glacier-fed, Himalayan water sources for their survival. While losing ice is a natural part of a glacier’s lifecycle, many glaciers are now sloughing off faster than they are accumulating new snowmass. In other words, they’re shrinking. This shrinking is largely attributed to climate change. Not surprisingly, rising temperatures cause glaciers to melt at faster rates. 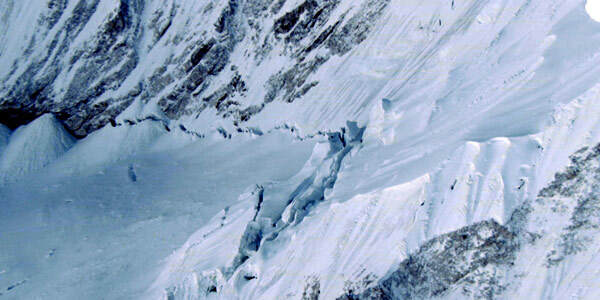 Unless snow accumulation increases at a similar rate, the glacier cannot sustain itself. Scientists have reported temperature increases above the global average at higher altitudes, where glaciers are often found. The future is not looking bright for Himalayan glaciers. But there’s another culprit when it comes to receding glaciers. Soot. A December 2009 study released by NASA and the Chinese Academy of Sciences found that an increase in black carbon particles and pollutants settling on glaciers actually accelerates the melting process. How? Glaciers act like mirrors. They absorb only little of the heat beating down on them, reflecting most of it back into space. By adding a layer of carbon to the ice, glaciers go from heat-reflecting landforms to heat-absorbing landforms. Unable to reflect the sun’s rays, glaciers absorb that heat, which accelerates their melting. Could there be a bright side to soot? A January 2011 study by researchers tied to the University of California, Santa Barbara shows previously receding glaciers in the Karakoram Himalayan mountain range are now stabilizing. Over the past twenty years, glaciers in this particular region have shown a shift, with 58 percent of them either stable or growing. These glaciers may in fact be benefiting by a cover of debris. While a thin layer of debris accelerates the warming process, if the coat is thick enough, it could insulate the ice from the sun’s rays. But it’s not all good news. Despite this one somewhat optimistic finding, the report still found that 65 percent of the glaciers studied throughout the Himalayas are receding.